The following events and tours are all happening in conjunction with the Living Barge. All events are free, most are appropriate for all ages and will take place rain or shine. Tours are on a first-come, first-served basis. Check back often for lake-breaking events. To request a tour, contact Sarah Kavage. 4 - 6 pm: Inaugural Duwamish River boat tour (reservation only). *NOTE*: the opening day tour is full! We are still taking names for a wait list in case of cancellations or future tour additions. 6 - 8 pm: Opening Reception at Gateway Park South, 8th Ave S and S Portland Street. Featuring a welcome from the Duwamish Tribe and surprise sounds by local musician Mark Johnson. Come explore all the historical, delicious, and unique things South Park has to offer! Take a guided or self-guided walking tour, check out local artists and local businesses and restaurants. 10:30 AM - 3:30 PM: Guided walking tours will start hourly on the half-hour. Meet at the South Park Neighborhood Center, 8201 10th Ave. S.
6 - 9 PM: South Park's first art walk, featuring all South Park artists! Along the 14th Avenue business district in South Park. 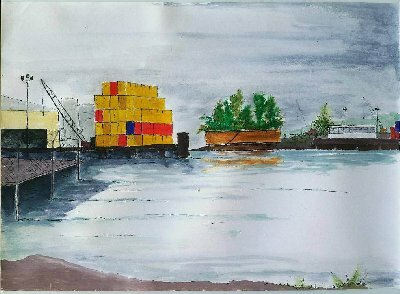 11 am, Gateway Park South (8th Ave S and S Portland Street): Join members from the Seattle Chapter of the American Society of Landscape Architects on a tour of the Living Barge with the artists. 1 pm. 2 pm. 3 pm: Tour the Duwamish with an expert! By water in a small motorboat. Guide: George Blomberg, Port of Seattle, with an introduction by the artists. Limit 6 per tour. 2-6 PM: Sculptors Gregory Fields and Kim Graham will lead participants in the creation of their own ceramic tiles. At the South Park Neighborhood Center, 8201 10th Ave. S.
1 pm, Gateway Park South (8th Ave S and S Portland Street): Tour of the barge for kids of all ages, led by students at Aviation High School. 2 PM: Post-work celebration at the South Park Neighborhood Center (8201 10th Ave. S.) featuring an encore performance of "Captain Duwamish", a play about the Duwamish written, directed and acted by students at Aviation High School. 8 pm: Party at the County Line featuring The Anna Kemnitz Project, The Swains, and Special Guests. Doors at 8, music starts at 9. 8456 Dallas Ave. S. in South Park. 12 noon: Celebrate progress being made on the construction of Cesar Chavez Park and help replant the plants from the Living Barge at their permanent location there. Join us at Cesar Chavez Park, on Cloverdale Street just west of SR 99.